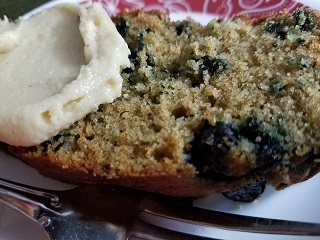 This is a blueberry muffin in an easy loaf form. I could eat this whole loaf- but I don't. Ha! Mix dry ingredients together. Add wet ingredients, stir just until combined. Fold in blueberries. Pour into greased loaf pan or use silicone pan. Bake at 400 degrees for 20-25 minutes until toothpick comes out clean. Cool in the pan, invert and slice. Could frozen blueberries used instead of fresh? Of course!! :) I use frozen all the time! 1. what kind of vinegar? I used coconut vinegar because I wanted to keep the same flavor. 2. My husband and I wanted to lose over 40. Your post says makes 12 standards servings of grain and partial fat. I don't want to sound ignorant, but I'm assuming that I slice this into 12ths. Based on what we are supposed to eat for a P3 breakfast, do we get one slice? Do we add a meat and vegetable to this? Sorry, just want to do this right. Thx!!! You are great! If I use cranberries, how much more xylitol? Have you played with this yet? maybe double it. thoughts? I dont think I would double the xylitol. That would make it way too sweet. I have made it with cranberry and it was good. I expect cranberries to be tart, the bread is sweet, so it is a good combo. Do you let this rest the 15 minutes as you do in your original blueberry muffin recipe? Or are you finding that is not necessary? I generally let everything I bake with sprouted wheat flour sit for a bit before baking. Sometimes I need to add more liquid as the flour absorbs moisture. Can you substitute spelt flour for the sprouted wheat or do you recommend sticking to the wheat? Spelt is only p1 and this recipe is p3. I just made this. The batter is delicious. I'm just patiently trying to wait for the bead to cool. How long do I need to wait? I'm not a baker so sorry for the silly question. Also what meal on P3 just breakfast or optional dinner right? Most baked goods need to cool for 10 minutes or so before removing from the pan. Since this is a grain, it is for any meal on the meal map in p3 that requires a grain. what is the difference between birch xylitol and xylitol? If you follow the FMD, you want to use Birch or Hardwood derived xylitol as the other is from corn and there is no corn on the FMD. There are many factors that play into this. The size of the eggs, the milk you use, the brand of flour, humidity, oven temps... make sure the batter isn't too thick. You really should let it sit, and you may need to add more liquid. You could also lower oven temp by 25°. If you're add xanthan gum, try adding a other pinch. Thanks...I have xanthan gum and could use it but didn't see it in the recipe. How much would I use and would it take the place of something else? If I add more liquid what would work best (water, milk, oil)? Should it be the consistence of pancake batter? 1/8 tsp xanthan gum. It doesn't replace anything. If you add more milk, it could change the portions. Oil is never really considered a liquid in baking, so I wouldn't add more of that. I can't really say it should be like pancake batter because everyone makes theirs differently. This should be a thick batter that can be poured. Thanks...I'll try the xanthan gum and add a little more milk if needed. We are on P4 so the portion won't be critical or I can make smaller pieces. I do think our batter was too thick as it couldn't be poured. I'm sorry to here it didn't turn out. I'm not am expert on high altitude baking or how that would effect this recipe. Did you let the bread cool in the pan? When I Google your question, this is what I get..."Adjustment for 5000 feet: Reduce baking powder: for each teaspoon, decrease 1/8 to 1/4 teaspoon. Reduce sugar: for each cup, decrease 0 to 2 tablespoons. Increase liquid: for each cup, add 2 to 4 tablespoons. Increase oven temperature by 25 degrees F."
Did I read somewhere that this recipe can also be made into muffins? Yes, you can make muffins. Bake for around 15 min. May I ask what brand of baking powder you use and where you buy it? I mix up my own since most store bought has cornstarch. Equal parts baking soda and cream of tartar. Can I use oat flour? I made this and it was extremely dry. The batter was so dry it wouldnt mix together. Is it really just 1/3 cup almond milk? Some of the other bread recipes have 1 1/3 cups liquid. I did use coconut oil in place of the olive oil and coconut milk instead of almond milk. Any help is appreciated. Thanks! Did you melt the coconut oil? Coconut milk in a can or carton? I've made this recipe dozens of times and it's never dry. Maybe the brand of of flour you have? This is actually a muffin recipe that I typically bake in a loaf pan. 1/3 cup milk is correct. I just made this with coconut milk and had to add extra liquid . I made the blueberry muffins with spelt flour for P1. So yummy and moist. Love all your recipes. Thank you so much for sharing your talents.